Catering to US pet owners and pet businesses. 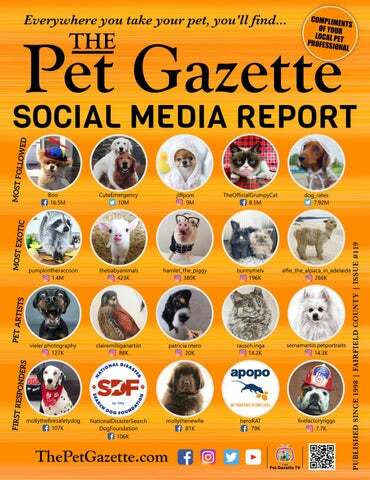 New features now available daily online at ThePetGazette.com and via The Pet Gazette App. Editors: Jason Klatsky, Jeremy Sage, Jaydeep Kacha Writers: Jennifer Galluzzo, Louise Suzanne Boyd Graphic Design: InMotion Media Digital Publication Founder: Jim Dempsey Publisher: Jason Klatsky PO Box 432, Somers, NY. 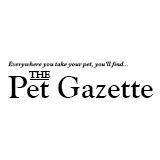 10589 info@thepetgazette.com, 914-273-9721 If you would like your business to be a part of our distribution, send a request to: Jason Klatsky, jason@thepetgazette.com We accept photos, opinions, short articles, stories, poems and drawings from the general public. We assume no responsibility for failure to publish a submission or for typographic errors published, or incorrect placement. The content of the magazine consists of copyrightable material and cannot be reproduced without the expressed permission of the publishers. t has been a year since we launched our #pets Wanna-Be-A-Celebrity Contest and the race to win a GoPro Hero camera. Our contestants are amassing followers, but remember it is a hard and steady road to “going viral” requiring ongoing posts filled with ever more interesting content. Although it “only takes one” viral post to get to the next level, your likelihood of success is greater if you have a solid and varied foundation of content. This enables your posts to appear more often to those who might follow you. Our Social Media Spotlight Report reveals more tips, tricks and pitfalls directed to increasing your social media following. We have highlighted 5 of the best stories to come our way and have given plenty of shout-outs to many others. Our contest continues, so keep plugging away and follow these profiles. The pet lover inside you will thank you! triggers and more. Check out her website www. surfdogricochet.com and click on “healing”. #1 Ricochet How did your pet become an internet star? One of our videos went viral https://youtu.be/BGODurRfVv4 It currently has 6.5 million views. In addition, we’ve had a lot of stories done by the media, tv, and movies. Ricochet is one of five dogs that have been cast in an IMAX film called Superpower Dogs. How much of a time commitment is it for you? At least 12 hours a day! What do people love most about your pet? People are drawn to Ricochet. So, I think what they love most is the connection she makes with them. The veterans with PTSD tell me what they love most is that she believes them about their symptoms, triggers, etc. when nobody else does. Is your pet making money from being an internet celebrity? How much? No, but she has raised over $500,000 million dollars for human and animal causes. Has your pet helped anyone along the way through social media that you know about? She has helped millions of people!! Whether it’s through fundraising, support, stories or face-to-face interaction. How did you decide on their online persona? She was doing a fundraiser for a boy who is quadriplegic. So I initially started her pages for that purpose. But, since then she has provided much support to people all over social media. What do people love most about your pet? Rufus is famous for his happy-go-lucky attitude. He is good with other dogs and children. He is very well socialized and well traveled. Rufus is one of the few hounds to be allowed in Graceland. He’s been to 20+ different states including the Grand Canyon twice, Mount Rushmore, and many national parks. How did your pet build their following? It’s been our mission, mostly Rufus’s Favorites: on Facebook since 2012, but Activity – Frolicking on a beach or hiking in the slowly on other social media mountains platforms, to engage, entertain Toy – Anything that squeaks, because it and educate our Dachshund won’t squeak for long. loving public. We want to be a Food – All. Our dogs are big chow resource of entertainment and hounds. Our pack also education. We simply try to likes it all. They’re not discriminating. lead by example and encourage our friends to include their Dachshunds as part of their daily and weekly routine. Get out. Go exploring. Enjoy an adventure with your best four-legged friends. Dog socialization is our biggest endeavor. We advocate that we stimulate their bodies and minds by getting out of the house together. Good for humans and good for hounds. Is your pet making money from being an internet celebrity? How much? Rufus has helped to raise money for charity and to produce many community outreach events - like Canine Dental Presentations, monthly meetups, and annual dog-centric celebrations. Has your pet helped anyone along the way through social media that you know about? Yes. We have inspired and encouraged many people both near and far to be active with their pets. We have helped hounds and their humans to manage their weight properly, stimulate their minds and bodies via regular walks and outdoor exploration, and to keep those teeth clean, all in an attempt to ensure a long, good quality of life. How did your pet become an internet star? Slowly over time we just noticed more and more strangers commenting. How much of a time commitment is it for you? At first very little but I try to spend more time now. Does your pet have any special or funny talents? Waffles is very patient and will wear costumes without complaining. What do people love most about your pet? Waffles has a cute face with big eyes. How did your pet become an internet star? A video of Lilo cuddling with our then foster kitten, Rosie, went viral after we posted it on social media. How much of a time commitment is it for you? It varies depending on the projects we work on. Does your pet have any special or funny talents? Rosie does tricks, just like the dogs do! What do people love most about your pet? They love the relationship between Lilo and Rosie. Is your pet making money from being an internet celebrity? Yes, but we’re not at liberty to say, our sponsors have privacy clauses. 100% of money earned through social media goes directly into our nonprofit kitten rescue! Has your pet helped anyone along the way through social media that you know about? We get emails from people telling us that our photos help to ease their depression, which is great! How did you decide on their online persona? We got a dog named Lilo and she is a husky, so Lilothehusky it became! Does your pet have any special or funny talents? She has learned to play dead when I use the “killing curse” from Harry the Potter. #5 Daisy Rey How did your pet become an internet star? A few successful viral videos, some original ideas, and a very cute face. How much of a time commitment is it for you? Creating new content can take as little or as much time as you allow it. I consider the social media work as a part time job. /dawgpainter 5.1k ӹӹ Pet portraits and animal art ӹӹ Canvas, metal and framed prints, posters, and greeting cards ӹӹ The perfect place to find something to brighten up your home or find a great gift ӹӹ Specializes in pet portraiture, using her skills to unleash your pet’s colorful personality! 1 Boo @Boo 16.5m ӹӹ A Pomeranian who became an Internet sensation ӹӹ Belonged to a San Francisco-based Facebook employee who created a Facebook page for the dog with the statement “My name is Boo. I am a dog. Life is good” ӹӹ Favorite foods: chicken, cheese, flowers, grass and dirt ӹӹ Favorite games: running outside, following around big bro, squeaky toys! 6 Cole and Marmalade /coleandmarmalade 547k ӹӹ Cole and Marmalade are both adopted in 2012 and 2013 respectively ӹӹ Marmalade (goes by Marm - cool nickname) recently survived a cancer scare ӹӹ Cole - 2012 Friskies “Catness” Winner! ӹӹ Marmalade - 2014 Friskies “Strange” Winner & Grand Prize Winner! MORE POPULAR PETS TO CHECK OUT Delivering Happiness! Combined, these pets have over 100 Million followers on Social Media!! Check them out today and see all the adorable and funny pictures and videos they post that are sure to put a smile on your face! Fizzy Fizz (right)1 year, Blue Bird (left) 2 years. Good friends.